An audio described performance is tailored for individuals who are Blind as this provides them access to the theatre where images are a critical element. In an audio described performance, the play is verbally described to the audience members through their personal headsets that is worn throughout the performance. Depending on the venue’s equipment, these headsets may be provided, or you would have to bring your own. The commentary describes body language, expressions and movements that take place on the stage. It makes use of descriptive, vivid and imaginative words to convey the visual information that the scene presents. 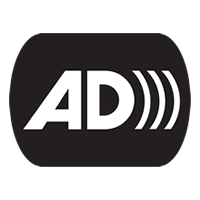 The audio describer resembles a journalist who relays the facts of the events that are taking place on stage. Some of the things that an audio describer may describe, but not limited to, could be which characters are in the scene, what do they look like, what are the relationships between them, what colours are present and even directional information (such as the points on the stage that the actors are moving to and from). A Touch Tour allows the individuals to have a tour of the set, props or costumes used in the performance. Audience members can explore the stage to gain a sense of how the set and staging functions within a piece. They will get a chance to touch and feel some of the props and costumes used in the performance. Touch Tours usually take place between 45 minutes to an hour before a performance begins. A relaxed performance is designed to allow theatre goers a more ‘relaxed’ theatre environment. Patrons who may benefit from this performance include those on the Autism Spectrum, Neuro-diverse needs individuals who have various learning and communication needs or just anyone who would prefer a sensory friendly setting to watch a production. In a relaxed performance, the lighting and sound cues are adjusted to be less startling for the audience members. The reduced lighting and sound levels are maintained throughout the play. At the start of the show, the actors may introduce themselves and the characters that they will be playing. One can also exit and enter the venue at any time and if they need to take some time out of the theatre, there will be a quiet and sensory friendly room ready for them to use. Any sort of ‘distraction’ that would be frowned upon in a traditional theatre setting, such as noise and movement from the audience members during the performance, are allowed in a relaxed performance. There is no fear of breaking any social rules on how you’re expected to behave in the theatre. Visual stories can help an individual familiarise themselves with the venue and performance experience before they visit. It also includes information for them on what to expect at the venue and why. This aids in alleviating some of the individuals’ anxieties associated with unknown experiences. A visual map provides individuals with information on the safe and accessible routes to the venue. It also helps in alleviating the anxieties that an individual may experience with regards to going to an unknown venue. Signed performances are designed to cater to individuals who are Deaf. An introductory signed video may be played at the Front of House or presented live on stage before the performance begins, depending on the venue. In a signed performance, there will be a trained interpreter, who will be placed in a visible position on stage. The interpreter will sign both the heard and spoken aspects of the show using Singapore Sign Language. Individuals who require this assistance are also allocated a specific area of seats nearer to the interpreter so that they will be able to get the best view of both the interpreter and the performance. Captioning allows for the audio content in a performance to be accessible for individuals who are hearing impaired. The soundscapes and dialogues in the performance are transcribed into words which are then projected onto a screen or onto a TV monitor on stage, or even offered on individual tablets or screens held by the audience members themselves. The captioning would be pre-written and is based on the performance script. This can also benefit a wider range of audience members as some individuals may enjoy being able to read the text together with watching the performance. Captioning can also be useful to audience members whose primary language is not English.